Popy Boxed Figures: These figures were made by POPY, a division of Bandai. 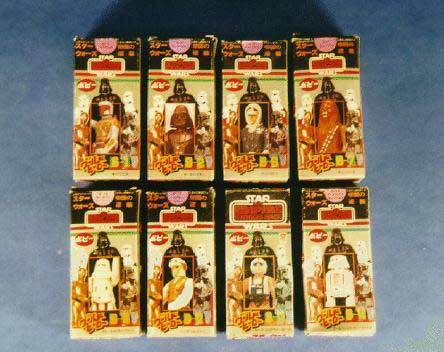 In 1978 Takara sold Kenner Star Wars figures with additional information stickers on front. In 1980 Popy sold repackaged in that box. In 1983 Tsukuda sold Kenner ROTJ figures with additional sticker on back bottom. There were 15 figures in this set. They are all from Star Wars and The Empire Strikes Back. The figures are identical to regular figures but it's the unique packaging that makes them interesting to look at.